We conducted a quick grammar practice today. Then students prepared their exam materials and checked their study guide answers. Students finished their NWEA TESTING. When completed, they continued working on their Lemon Brown tasks. These are to be ready for tomorrow's class. We began reviewing topics for the midterm briefly today. Then we discussed some topics from "The Treasure of Lemon Brown." We began exam reviews today. We reviewed grammar topic today and students were given their practice exams. Students work with peers on a review for tomorrow's test. Students were in pairs today working on tasks related to last night's reading: "The Treasure of Lemon Brown". We completed a series of Lemon Brown Story Tasks. We will continue these tasks in between NWEA testing this week. I began class today showing the remaining calendar for this semester. (The quarter ends with semester exams on January 23, 24, and 25.) Before we left for break, we had read Chapter 13 of Bad Boy. It's expected that students may have forgotten what was happening in the novel at that point. So today, students read an abridged (shortened) version of that chapter and completed close reading activities on this Chapter 13 Close Reading Assignment. I will collect this completed work tomorrow. Many students finished that assignment in class. When finished, students were assigned to read pages 155, 156, 157, and 158 for tomorrow's class as well. If you do not have your novel, here is a COPY OF THE TEXT. Today we did our best to charge through some of the ending chapters of Bad Boy. We finished chapters 14-16 today in class. Students are to read Chapter 17 tonight and finish the responses to the Reading Marathon Comprehension Questions. We finished Bad Boy today in class and completed some summary writing reflections. We will take our Quarter Two Test on Tuesday. After collecting the homework from the weekend, students took part in a quick Find and Fill In activity to help us review what they read over the weekend. We explored a couple questions for discussion: How is Walter's life at this stage of the memoir? What effect has his love for reading had on his schoolwork? How are Mrs. Conway, Mrs. Loella Bates Washington (from "Thank You, Ma'am") and Mr. Lasher similar? Then we began reading Chapter 7 together. We will finish that chapter together tomorrow in class. We finished Chapter 7 today in class. In their spirals, students created written responses to the Chapter 7 tasks. Then we began reading Chapter 8. This is to be completed for tomorrow's class. Students began reading Chapters 9 and 10 today in class. As they read, they worked on the Chapters 9-10 Sheet. For those who did not finish in class, this is to be ready for tomorrow. We conducted student readings today. Each student in the class read out loud and then chose another student to read next. We finished pages 114-136. If you were absent today, you can make up that reading at home. HERE is a copy of the text if you do not have your book. We finished Chapter 13 in class and then worked on this Similes and Metaphors practice. Students were in small groups today. After reading Chapter 2 together as a class, students participated in alternating verbal readings for Chapter 3. As they read, students stopped and completed these Chapter 3 tasks in the classwork section of their spiral notebooks. Here's a copy of the text if you left yours at school. Students worked in small groups today. They examined each other's work from last night and made corrections to a partner's writings. After reading a partner's paragraph from the homework, each student provided written feedback reflecting a complimentary tone. Students then highlighted the words they used to create that tone. Finally, students participated in alternating verbal readings for Chapter 4. We read Chapter 5 - "Bad Boy" as a class. Then we began a closer look at two sections of that chapter by carrying over yesterday's introduction of the term tone. In small groups, students examined both sections to determine what words in Myers' writing reflect his tone. I provided an example for the first section showing how to key in on the specific wording used by the author to create tone. Students looked at one more specific section from Chapter 5 today. This section focused on the relationship between Walter and his teacher, Mrs. Conway. Students used highlighters to identify text that showed how the two felt about each other. Then they demonstrated elements of a paragraph in support of their findings. At that point, we took a small break from the novel to read "Thank You Ma'am" by Langston Hughes. Students conducted an academic reading of that text and began responses to two written prompts. These are to be be ready for tomorrow's class. Today, students created written responses to six different prompts related to "Thank You, Ma'am." I collected those for grading. After that, I began Chapter 6 -"Mr. Irwin Lasher." Students are to finish that chapter over the weekend and complete the Chapter Six Direct Quotation Practice for Monday's class. Students took part in a one-day challenge today. They were given the name of a famous person who will be mentioned in our upcoming novel. In one period, they researched their famous person and created a one-slide PowerPoint with biographical information. Wrapping up our discussion of nonfiction text structures, students looked at examples of each today. The final one we looked at was memoir. For homework, students are to academic read the last page from Today's Samples and identify elements of a memoir. In class today, students reviewed elements of a sentence in anticipation of Friday's short quiz. Then we began setting up our upcoming novel by exploring elements of memoirs. Students began examining questions aimed at considering their own families and relationships. We used today's class to examine elements of our upcoming novel. We drew conclusions based on the cover of the text, and we looked at elements within the text itself. We also created partial family trees. Tomorrow, as we begin the novel, students will attempt to map out the author's family tree from information provided in the first chapter of his memoir. After our grammar quiz, we read the first chapter of our novel and had some fun trying to map out the author's family tree. Today students learned the three essential parts of a sentence: subject, predicate, and complete thought. They practiced working with some parts of speech and identifying subjects and predicates in sentences. For, homework, they are to finish this grammar practice page. Students were in small groups today. We practiced subjects, predicates, and clauses. They did great! Today we learned about genres. Students identified samples of musical genres and movie genres. Then we began exploring literary genres. In particular, we're looking at types of nonfiction. Students began by writing a feature story about another person in class. Tomorrow, we'll explore editorials, autobiographies, and biographies. We started class today in small groups practicing identification of subjects/predicates and clauses. Then we continued exploring forms of nonfiction. Students practiced identifying subjects and predicates today in class. Then we continued our exploration into forms of nonfiction writing. Students completed a verb quiz today in class. Students worked with a small packet containing Two Native American Reading Selections. Students conducted an academic read and responded to the writing prompts. For the first selection, I provided this definition list. For those who did not finish in class, the work is to be completed over break. 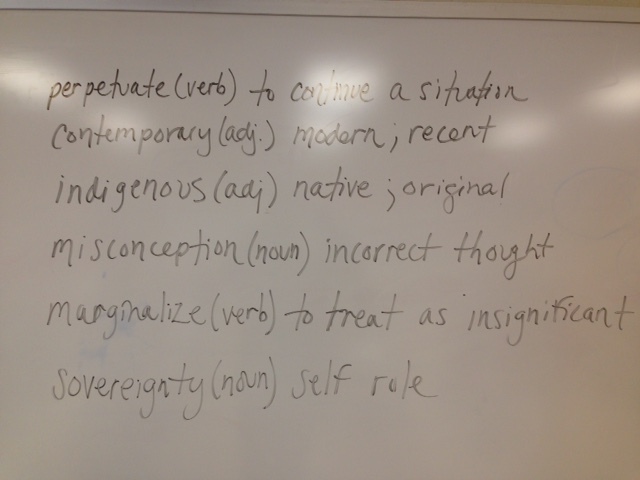 Students memorized this list in class, and then we began to look at how these words help being meaning to other verbs. I introduced the term verb phrase. Finally, students began simple identification work with this first VERBS SHEET. We've had an impressive start to the week. Yesterday, nearly the entire class memorized a list of 23 helping verbs and learned what a verb phrase is. We began class today with some rapid fire practice of that work from yesterday. Then I introduced the functions of linking verbs. 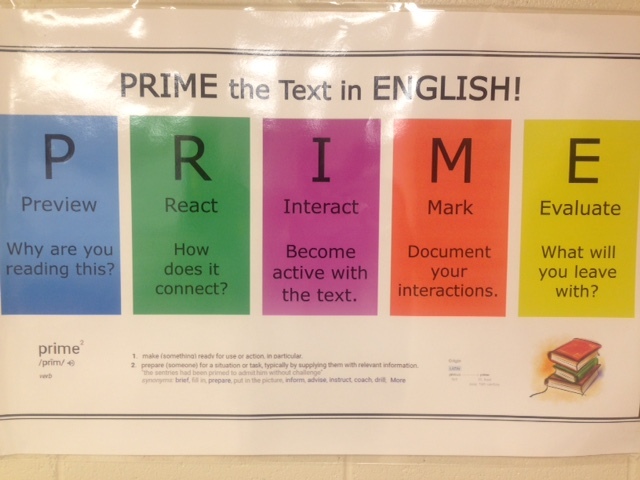 Students used this Linking Verb PowerPoint and Practice in class. Tomorrow we will work with all three verb types. All this verb practice will help us as we begin clauses next week! Students worked on their Verb Exit Card today in class. This is due tomorrow in anticipation of tomorrow's verb quiz. Our verb quiz has been put off until Monday. Instead, we practiced together a bit more today. Before students left for the weekend, I passed out this Fiction/Nonfiction Assignment. There are two selections on the page. Students are to determine which is fiction and which is nonfiction. Then they are to provide a paragraph supporting their answer. Students were taken to the Presentation Room today for the OK2SAY presentation. We reviewed topics that will be covered on tomorrow's English test. I used this Review PowerPoint to remind the kids of some of our work during the first quarter. (We conducted academic reads of over 20 pieces during the first quarter!) Students also practiced academic reading with this fire article. Students took a test today. After students finished their tests today, they began a short exploration of prepositions. To begin, they used the grammar books to complete Grammar Book Preposition Tasks. When finished, they are to try this Preposition Self Assessment without their notes in front of them. This work is to be completed for Monday's class. We examined this weekend's article "The Looking Glass Self" today in class. Students identified the central idea of that text. Then we looked at a second nonfiction text. During our academic read, we made connections across the two texts. Finally, we began to read our next myth: "Echo and Narcissus." We will finish this story tomorrow. We finished "Echo and Narcissus" today in class. As we read, we continued to identify examples of characterization from the story. When finished, I introduced the format for quoting text. Students then pulled textual evidence proving the author's characterization of Echo and Narcissus. They practiced the format for introducing quoted text on Quotations Sheet. Any remaining quotations are due for tomorrow's class. Students created an argumentative paragraph in class today. We began class with a short journal entry. Then we conducted an academic read of King Midas and the Golden Touch. Today students read a second version of King Midas and the Golden Touch. We reviewed the proper format for delivering quoted text, and I passed back graded quote practice homework assignments from earlier this week. After an academic read of today's story, students practiced delivering quoted text by contrasting the two versions of the story. For homework this weekend, students are to academic read "The Story of Prometheus" and created written responses to the reading questions. We began looking at some tough questions today in class. I instructed students to provide answers to these questions or simply make up creative answers. We took ideas from the class, and then began exploring mythology. As a class, we began conducting an academic readings of our Mythology Introduction and The Science of the Seasons. We looked at another nonfiction pieces related to the changing seasons, and we continued to practice chunking the text to help us understand small parts at a time. Then we began reading the myth "The Origin of the Seasons." We will finish this story tomorrow. We finished "The Origin of the Seasons" together in class and then identified literary elements. Then students created responses in the journal section of their spirals to these prompts. We held a small discussion today in class about the social media apps students use and how they use them. Then I presented elements of argumentative writing. In their spirals, students began demonstrating those elements of argumentative writing in the form of a paragraph. Here is the prompt and instructions. This full paragraph is due for tomorrow's class. Today students submitted a Final Copy of their argumentative paragraphs. When finished, they began conducting an academic read of the article "The Looking Glass Self." The vocabulary and sentence structure in this article are a bit more challenging. As part of their academic read, they are to select two sentences from each of the four paragraphs to summarize in their own words. Hopefully this chunking of text will help them clarify the writer's language. We began class today with the last question from Friday's (pink) homework assignment. I introduced the idea of topics and themes. A topic is a main idea from the story; it is usually expressed in with single word. For example, we identified loyalty as a topic in "Rikki-Tikki-Tavi." To create a theme, we asked ourselves, "What does this story teach us about loyalty." A theme is a universal truth--something that applies to all people. A theme is written as a statement. The story teaches us If you are loyal to someone, he or she will show loyalty in return. Students then explained how this theme applies to Rikki-Tikki-Tavi. After this work with theme, students took a short pop quiz on some of our concepts from last week: fiction/nonfiction, protagonist/antagonist, and plot elements. For homework, students should conduct an academic read on another nonfiction piece "Sea Girt Lighthouse Citizens Committee." 3 Skeleton Key. We defined the term mood as the overall feeling or atmosphere in a situation. After line 25, students selected an adjective to describe the mood being created in the story's exposition. They wrote that word directly on the first page of their stories. Some said creepy, scary, frightening, mysterious, dangerous, or spooky. Then students identified words from that first page of the story that helped create that mood. For example, students circled prison, frightening, scared, skeleton, died, isolated, sharks, bones, died. So we showed how an author's word choice can create a mood to set up the story. We then continued reading. Like we did with "Rikki-Tikki-Tavi," we stopped after chunks of text to provide sequence summaries. We got through the first two sections (26-45 and 46-66). We will finish the story tomorrow. We finished our reading of 3 Skeleton Key today. Students also finished their summarizing sequencing and began their two response questions on the bottom of the sequencing page. Students participated in a group activity today. We've been working with plot elements and sequence summarizing this week in class. Today, I introduced the story "The Ransom of Red Chief" to the class. We read through the opening of the story to establish the exposition. Then I turned the rest of the period over to the students to read and identify the story's plot elements. We reviewed for tomorrow's pronoun quiz. Students also completed this practice quiz. The practice quiz looks very similar to the actual quiz students will see tomorrow. Students completed their All Pronouns Quiz today. We began exploring the difference between fiction and nonfiction today. As a class, we conducted an academic read of these two articles about mongooses. Tomorrow, we will build off these articles with a connecting fiction piece. We finished the academic reads of yesterday's nonfiction articles. Then we began reading "Rikki-Tikki-Tavi," by Rudyard Kipling. Our focus for today was creating section summaries by identifying sequences of events. We broke the story up into small sections. After each section of reading, students logged the sequence of main events and then provided a quick sketch or action shot of that scene. We got through line 100 of the story today, and we'll finish the rest tomorrow before exploring the story's plot elements. The class continued to provide sequencing summaries for "Rikki-Tikki-Tavi" in class. We finished the story today. Then we began to look at the plot elements and response questions from the story. As a class, we defined each plot element: Exposition is the background information on the characters, setting, and situation given to us at the beginning of the story. Conflict is the main struggle or challenge facing the protagonist. Rising Action contains all the events in the story leading up to the climax. Climax is located at the end of the story. It's the exciting or emotional scene that determines the conflict's outcome. The resolution is the solution or answer to the conflict. We then identified the plot elements from "Rikki-Tikki-Tavi. ": On Side 2, students are given 4 response tasks. For homework, they are to complete the first three tasks. Answers should be written in complete sentences. Some students finished NWEA testing today. Others got started on a writing piece for parent/teacher conferences. We began class today with this pronoun starter. Students created a The Writer sentence to explain what the writer did incorrectly in each sentence. After that, students worked on their Personal Pronoun Exit Card. This is just like the exit card we created after our academic reading introduction. Once I check these and pass them back, students will glue this into their spirals. Today we began to look beyond personal pronouns and began exploring other types of pronouns. Students began a self-directed set of tasks copying pronoun lists into their spiral, reading about the pronouns, and then practicing with them using our grammar books. For homework, they are to complete these grammar book tasks. We will continue to practice these pronouns in class this week. We reviewed some of yesterday's work with reflexive/intensive pronouns, interrogative pronouns, and demonstrative pronouns. We also introduced indefinite pronouns as well today. So, the class is swimming in pronouns! Tonight, students were given a grammar book task: Page 78 - copy the sentences and chose the pronoun that agrees with the indefinite pronoun. If you were absent today, you will make up that work tomorrow when you get a grammar book. We reviewed the answers to last night's homework and completed the activity from page 57. Then we checked our answers with this Answers Document. (That file reveals all the answers to our grammar book assignments from this week.) Students then used highlighters to identify pronouns on this pronoun finder practice. Finally, I passed out this two-sided sheet. The first side is a reference sheet for the students' binders. It contains an organized copy of all the pronoun lists we've worked with. All this information is already in their spirals next to the practices. I wanted them to have another clean copy as well. On the back, I've provided a horribly written short story. Students are to identify all the pronoun mistakes and correct them right on the page. This is due for Monday's class. We took a close look at personal pronouns today. I presented the Personal Pronoun Chart to students. We looked at examples at how the chart explains the why behind some of our formal writing rules. Students began practicing this chart in class. Students continued examining the functions of personal pronouns. We practiced our chart again, and then I introduced the term antecedent. An antecedent is the word being replaced by the pronoun. Example: My sister packed an apple in her lunch. In this example, students can identify the possessive pronoun HER. The antecedent to the pronoun is SISTER. Writers need to introduce the antecedent (noun) before using the pronoun. Finally, students used grammar books to complete activities aimed at identifying pronouns/antecedents and making choices between personal pronouns (its, their, your) and contractions (it's, they're, you're). If you were absent today, you will complete those grammar book activities tomorrow. Students worked on applying our concepts from the pronoun chart today. As a class, we worked through 4 Sample Sentences. Students identified the error in the sentence, corrected it, and then created a "The writer" statement explaining what the writer did incorrectly. Then, they worked with partners on the Explain the Corrections practice. For each item, they made the corrections and provided a "The writer" statement. (Examples of these kinds of statements can be seen on the 4 Sample Sentence link above.) We then discussed these answers as a class. Everyone sounded very intelligent today using grammar language to discuss writing errors. I think students have a strong sense we may have a quiz tomorrow! In class today, we practiced filling in our personal pronoun chart. Then we addressed some review questions together as a class. Tomorrow we will review the answers to those questions before anything may pop up. ​I would never announce a pop quiz, but tomorrow may be a poppin' pronoun day around here! We began class today reviewing the answers to yesterday's pronoun review questions. Then students completed a short pronoun quiz. With the time remaining, they began academic reading another short fable titled "The Little Red Hen." Students are to finish this academic reading activity for Monday's class. 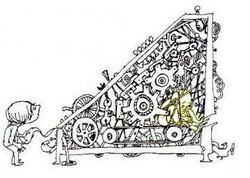 The academic read should include reactions/predictions about the title and illustration, connections in the text, identification of the conflict, the author's use of repetition, short chunk summaries, a reader's reaction to the resolution at the end, and an identification of the fable's moral. Today we worked to recap our academic reading tasks from last week. Students were given an 8x10 sheet of paper and had access to crayons and colored pencils. On their sheets, they were to complete two tasks: First, they were to provide information on the three short stories we read last week. For each, identify the title, provide a short summary of the story, and state the moral for each. (These are lessons students can apply to their own lives as they work through their first year of junior high.) Second, students are to create a section detailing what it means to academic read. They can explain why we want to read like this and how we academic read. Identify different strategies we used when approaching our readings last week. This "Exit Card" is due for tomorrow's class. Today students reviewed academic reading strategies identified on their Exit Cards from last night's homework. Then I passed out "Brer Possum's Dilemma." I instructed the students to attempt an academic read of this story without my guidance. They marked their papers and answered the questions at the end of the story. This is due for tomorrow's class. I passed back the students' assignments from "Polly Sits Tight" today, and we explored example of textual support for our answers. I also passed back students' exit cards. We discussed last nights reading of "Brer Possum's Dilemma." Finally, we began looking at our first grammar topic for the year: parts of speech. I provided DEFINITIONS and example of each part of speech, and students recorded this in the the Grammar section of their spiral notebooks. Today students watched an 8-minute version of The Grasshopper and the Ants from Disney. We explored the terms compare and contrast. Students contrasted the print version of the story from class with this short animated version. We then practiced learning the functions of our parts of speech. Students practiced learning the functions of our 6 parts of speech, and they filled our boards with examples of nouns, adjectives, verbs and adverbs! Today we welcomed our new 7th grade students, and we reviewed the class syllabus. I am offering extra credit for students who get their syllabus signed and returned for tomorrow's class. Today we discussed the difference between casual and academic reading and we began practicing strategies for academic reading. We read Aesop's Fable "The Ants and the Grasshopper" and interacted directly on the text. We reacted to the title, author and date. We looked at the image on the page. We looked at how the author created vocabulary notations on the page. We also wrote reactions to the events in the text. We identified cause/effect and conflict/resolution from the story as well. On the bottom of the page students answered and supported answers for the following questions: Who was most wrong? Who struggled more? Who was happiest? Finally, students identified a lesson they can take away from the story. Today we continued our practice of academic reading. We read "The Three Little Pigs" and interacted directly on the text. We reacted to the title, author and date. We looked at the image on the page and made a prediction. We looked at how the author created vocabulary notations on the page. We also wrote reactions to the events in the text. We identified cause/effect and conflict/resolution from the story as well as the author's use of repetition. On the bottom of the page students answered and supported answers for the following questions: How is the number three important in this story? What word, aside from smart, would best describe pig #3? Finally, students identified a lesson they can take away from the story. For homework, students are to demonstrate academic reading for our third story "Polly Sits Tight." We looked at last night's homework to start class today. Students did a fine job of interacting with the text. We looked at the central conflict from "Polly Sits Tight." Students identified where in the story the author established the conflict, and we labeled where in the story the author used flashback. I passed out this 4-Question Assignment. Students finished these questions in class, but then we talked about what support is in our writing. When we respond to literature, we want to support ourselves with evidence from the text. On the back of these four questions, they began providing textual support for their answers on front. Some students finished this in class and turned it in. For those not finished, they took their sheets home to complete for Monday's class. Most perfect contraption that’s ever been seen. You homework comes out, quick and clean as can be. Here it is – “nine plus four?” and the answer is “three”. Three?